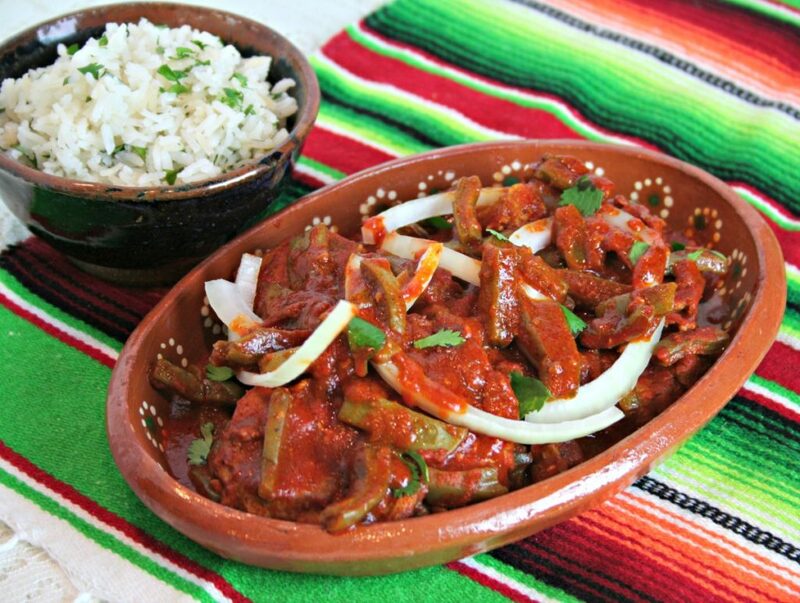 Our Chuletas con Nopalitos en Salsa Guajillo recipe will carry you to that magical place in your kitchen where you know everything is good and nurturing. And, in today’s fearful political climate, who of us doesn’t need some comforting? Right? Chuletas en Salsa Roja or Verde are total Mexican comfort food. The warmth of the pork chops simmering in a smoky salsa guajillo sauce with slices of onions and garlic exports you to a kitchen in Northern Mexico. Need I say more? You’ll want some handmade, soft flour tortillas to sop of this dish; that’s for sure! Pat the pork chops dry. In a large skillet, add oil and heat over medium-high flame. Add the pork chops and cook about 4 minutes on each side. Add water to skillet and cover. Allow to cook and water to evaporate about 5 minutes. In a medium saucepan, add the water, nopalitos, onion and salt. Bring to a boil and cook for 15 minutes. Strain the nopalitos removing the onion and set aside. In a medium saucepan, add oil and heat over medium heat. Add onion and garlic and cook for about 2 minutes. Add chiles and cook for about 30 seconds to a minute. Add oregano, cumin, and clove and peppercorns. Blend well adding more water as needed. Add the nopalitos and salsa roja to the frying pan with the pork chops. Add 1 cup of water and cook covered on medium-high heat for 15 minutes allowing the liquid to thicken. Garnish with half-moon slices of white onion and chopped cilantro. Thank you! One of our favorite meals.